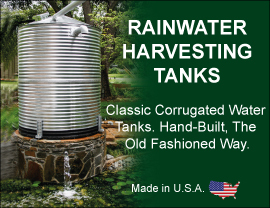 The Rainwater Harvesting Wall is a dual sided tank leaving the end user with two different cosmetic face options. 1) Beautiful rock wall face with modern touches. 2) Panel board face with style in mind. 3) Shelving units for flower pots, garden hoses and anything you might require to store within the tanks themselves. The Rainwater Harvesting Wall can be used as a simulated free standing privacy fence, wall attraction, living wall, water shed and will essentially be adaptable to the wildest imaginations because of its flexible size. The Rainwater Harvesting Wall is designed with functionality in mind. Installation is a breeze and can be installed by most homeowners in 10 minutes or less. The new tank comes with almost all of the components built in making it a breeze for installation purposes. The Rainwater Harvesting Wall is built with quality in mind. Our new tank is built from the highest food grade plastics available. Call toll free today: 1-877-655-1100 to speak to one of our friendly and knowledgeable Rainwater Specialists. The Rainwater Harvesting Wall is designed using an approved FDA / HDPE material. We manufactured these tanks with the environment in mind and chose a manufacturing method that allowed us to leave the smallest possible carbon footprint behind while creating our tanks. Manufactured in the USA and stored in two locations means shipping to you is extremely cost effect.